This tutorial shows how to mark rolls and switch between timetables / dates / classes. Note that for senior school in Term 4 there are 2 year 12 timetables, as year 11 begin the following Year 12 course denoted by the next calendar year. 1. In edumate, click on the ‘classic’ menu, then ‘Attendance‘ and then click ‘Mark Roll’. 2. Your current class should generally appear by default, however if it doesn’t, to mark other classes, click on the ‘Period & Events’ drop down menu to select which period for which you need to mark the roll. n.b. If you wish to mark a previous roll you may also change the date here before clicking the ‘Roll Date’ drop down menu. 3. In the list that appears, choose the appropriate period (red arrow below) for which you need to mark a roll. 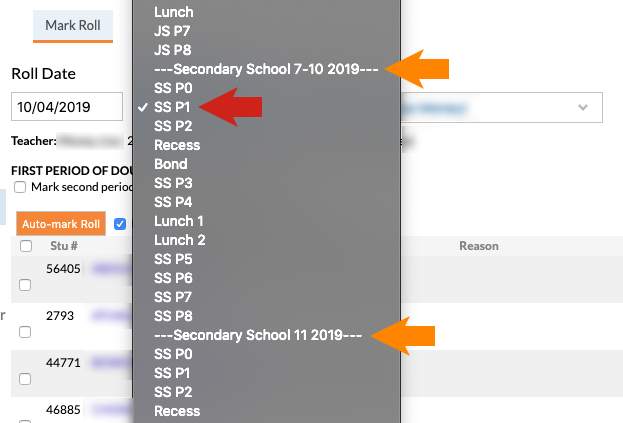 You will see the name of each timetable (make sure it is under the right timetable heading for the class also eg ‘–Secondary School 7-10 20xx–‘ orange arrows below). 4. If the period is a double period, you can tick the ‘first period of double’ option. 5. Mark the roll as you normally would, and be sure to click ‘complete roll’ once it is marked. You may go back and edit rolls for up to a week after they are marked. n.b. If you have access to rolls of many classes, you may need to click on the drop down menu next to ‘Class’ and choose the appropriate class after you have selected the appropriate period also.